Send a little aloha…in an “Over the Rainbow” Musical Message Bottle! Looking for a special way to send some aloha to someone? Look no further than our, “Over the Rainbow” Musical Message Bottle! Now you can share IZ’s music with your loved ones in a special keepsake glass bottle! Plays “Over the Rainbow” in full when you lift the lid! Only available at Hallmark Stores nationwide! 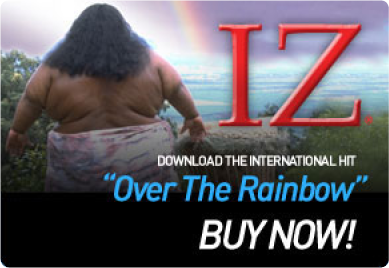 If your local store doesn’t carry them, then please request them so we can continue to share IZ’s music with everyone! This Austrian sugar commercial illustrates how everyone–man or animal, loves sugar! We think the same can be said about IZ’s music, do your pets like to listen with you? As 2011 draws to a close, we leave you with a clip of “Over the Rainbow” from the closing scene in Finding Forrester, a movie about a young man, inspired by a talented writer to pursue and hone his own writing skills. Has IZ inspired you to pursue music (or anything!) in life? We hope that you have a great 2012!! Happy New Year! !